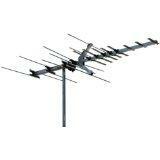 The best location for an antenna for optimum TV reception is outside, preferably on the roof or a high point. Usually, an outdoor antenna will get better reception than an indoor antenna. An outdoor antenna must be grounded. 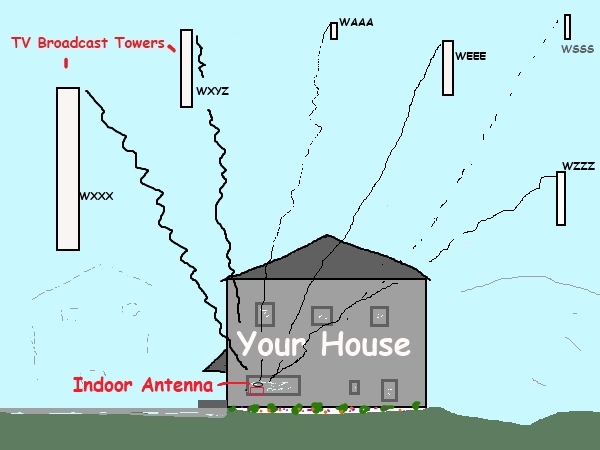 An outdoor antenna in your attic receives the signal broadcast from the TV station, possibly better that an indoor antenna because of height (and maybe because it is larger/has more elements or other factors.) The roofing and possibly the siding materials partially block the signal, so a strong signal to start with is necessary to use the attic location. Sometimes an amplifier or preamp is used to maintain adequate signal strength. Depending on the distance from the transmitters and terrain, the indoor TV antenna probably won't do as well as the attic or outside antenna. In some areas, this could be all you need to get some or all of the channels you want. If you are in an apartment, you might find this appealing because there are no outside antenna installations required and no holes and/or modifications to the building structure are necessary. A distribution amplifier or a preamplifier can sometimes help overcome signal loss related to splitters and long coax runs. Use an amplifier only if absolutely necessary. How Does the DTV Broadcast Signal Get to My TV? TV stations can broadcast on VHF or UHF. Although most of the new digital channels are on UHF, some stations in your area may be using VHF. 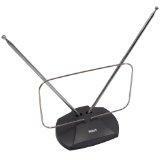 You need to select an antenna that will receive the channels in your area. There are antennas designed to receive both VHF and UHF signals. RCA Basic Indoor Antenna--This antenna is about as basic as you can get (other than a coat hanger). You can try to see how well this and other small indoor antennas work in your location. Some say it works great for the channels they want to receive if you are relatively close to the TV transmitters and the terrain is accommodating. For VHF and UHF channels. 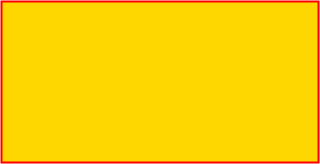 (Range may vary due to terrain, strength of signal, weather or other factors). Read the customer reviews. This RCA Outdoor TV antenna for both high definition and standard definition channels, is an optimized digital antenna designed for the most challenging reception environments. Look for the model that has an "R" at the end, i.e., RCA ANT751R, not the RCA ANT751. The ultra-small design allows placement where traditional outdoor antennas are not appropriate or will not fit because of their size. It is the perfect antenna for both urban and suburban usage. Receive local HD and DTV broadcast signals free, with reception of both digital and analog TV frequencies (VHF and UHF). The extended range signal reception quality is effective up to a 40-mile radius of broadcast signal. (Range may vary due to terrain, strength of signal, weather or other factors). Read the customer reviews. Small enough for easy attic installation! 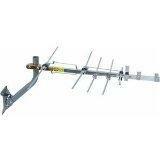 A medium to long range yagi: Winegard HD7694P High Definition VHF/UHF Antenna. It features exclusive retuning for UHF and VHF-Hi band only, which will bring you all HDTV and DTV channels from 7-69. It is larger the the RCA antenna above. It has UHF Elements: 17 VHF Elements: 11 Boom Length: 65 inches Turning Radius: 46. 25 inches Dimensions - 13 inches Height x 35 inches Width. (Range may vary due to terrain, strength of signal, weather or other factors). Read the customer reviews. The TV station broadcasts the signal over the air. 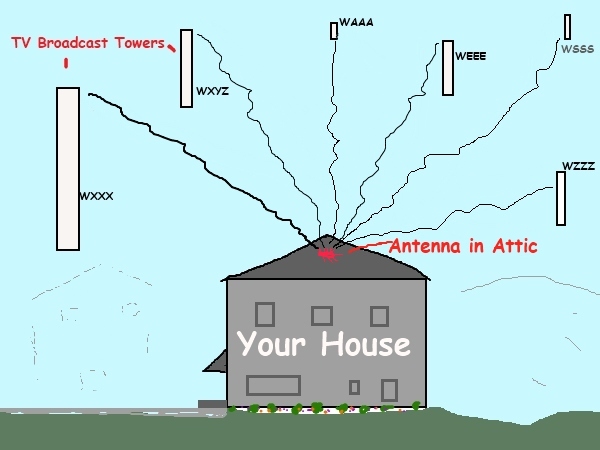 The signals are acquired by an antenna on or in your house. The signal is sent to your TV via a coax cable to process the signal into useful audio and video. Generally, the higher the location of your antenna, the more likely you are to get clear signals without interference. The closer your house (signal receiving location) is to the broadcast transmitter, the easier it is to receive a signal. Antennas are designed for indoor or outdoor use. Your TV Antenna might be directional (uni-directional) or omni/multi-directional. 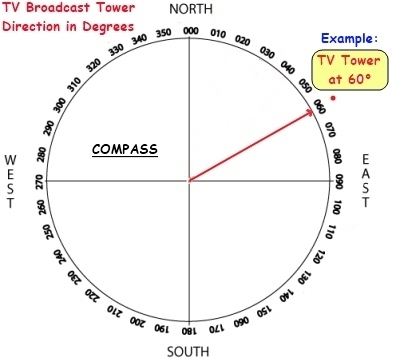 You can find what direction (in degrees) the TV stations are from your house on some TV locator sites. You can check what TV channels you should be able to receive at your specific address, and learn what type of antenna you will need--before you make an investment, i.e., based on the distance and other factors from your local TV station transmitters. There are several websites that can provide you with information.--But--Compare prices before you buy! (a page on this site will help you do that). A compass will help you aim your antenna for the desired channels. 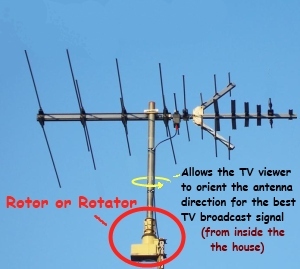 You might have a rotor (or rotator) for turning the antenna different directions for different stations. 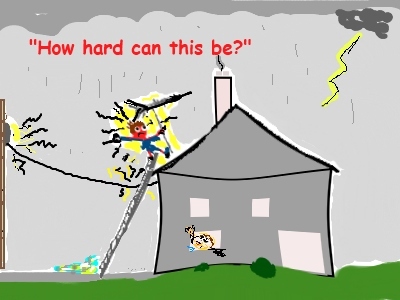 Know your limitations and call a professional installer if necessary! The best location for an antenna for optimum TV reception is outside, preferably on the roof or a high point. Usually, an outdoor antenna (sample) will get better reception than an indoor antenna. An outdoor antenna must be grounded. Depending on the distance from the transmitters and terrain, the indoor TV antenna (sample) probably won't do as well as the attic or outside antenna. In some areas, this could be all you need to get some or all of the channels you want. If you are in an apartment, you might find this appealing because there are no outside antenna installations required and no holes and/or modifications to the building structure are necessary. 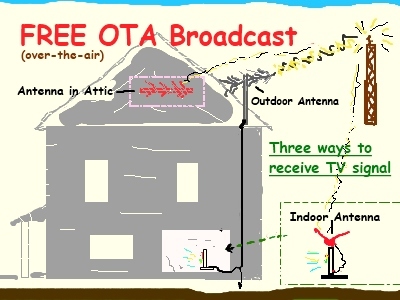 An outdoor antenna (sample) in your attic receives the signal broadcast from the TV station, possibly better that an indoor antenna because of height (and maybe because it is larger/has more elements or other factors.) The roofing and possibly the siding materials partially block the signal, so a strong signal to start with is necessary to use the attic location. Sometimes an amplifier or preamp is used to maintain adequate signal strength.